Now, anyone that has been following my blog for a while knows that around here we very much enjoy our waistcoats. This tends to lead to a certain amount of nerdy attention to detail, as shown in my series of waistcoat reviews for my ongoing Waistcoat Wednesday festivities. Details matter, otherwise all we have is an indistinguishable array of armless upper body garments, with little variation in design, execution or quality. How boring is that? 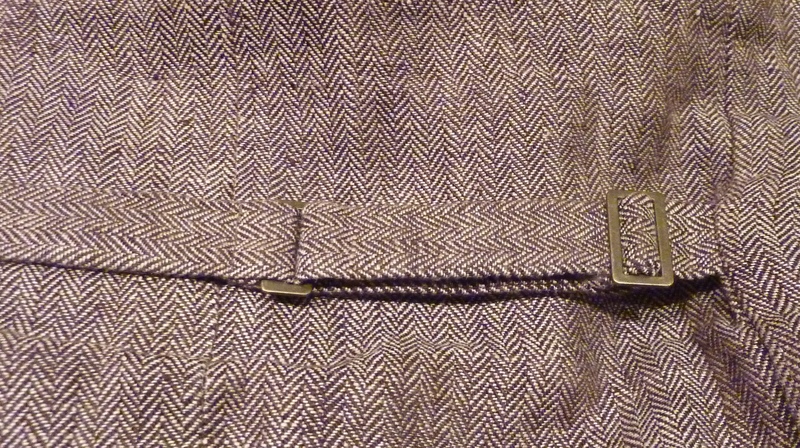 So, today I’m taking a look at one of my personal niggles when it comes to waistcoats: The execution of the rear cinch. 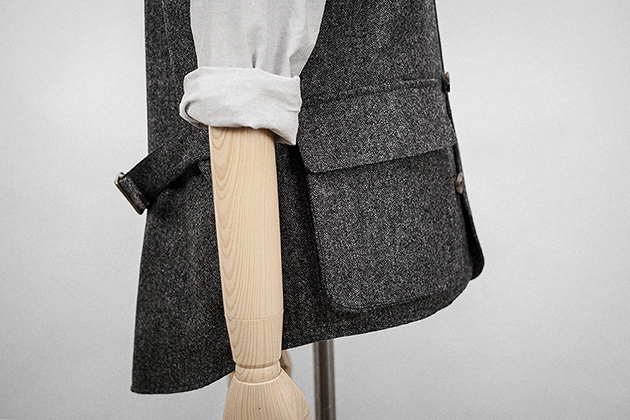 The rear cinch is the mechanism that allows the waistcoat to be tightened to snugly fit the wearers body. Not all waistcoats have the option though. I believe this to be a legacy of the suit-style of waistcoat, where a well-fitting waistcoat front was a large part of the look. Other more work-style vests would have a looser, more comfortable fit, with warmth and available pockets being more important than a well presented front-piece. Today a lot of the traditional uses for a waistcoat have been lost and the back cinch is more of a design feature than having a truly practical purpose. Yet, it needs to be done properly, and there are several factors involved in this, both design-wise and mechanical. 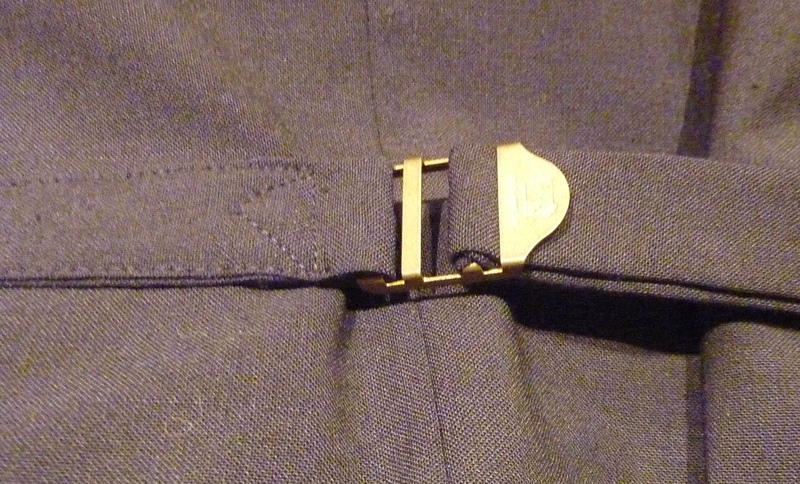 Looking at the design of the rear cinch, given that the function of the cinch is to tighten the front of the waistcoat, there are good and bad ways of doing this, especially is we add the requirement that the rear should stay neat and tidy even when tightened. 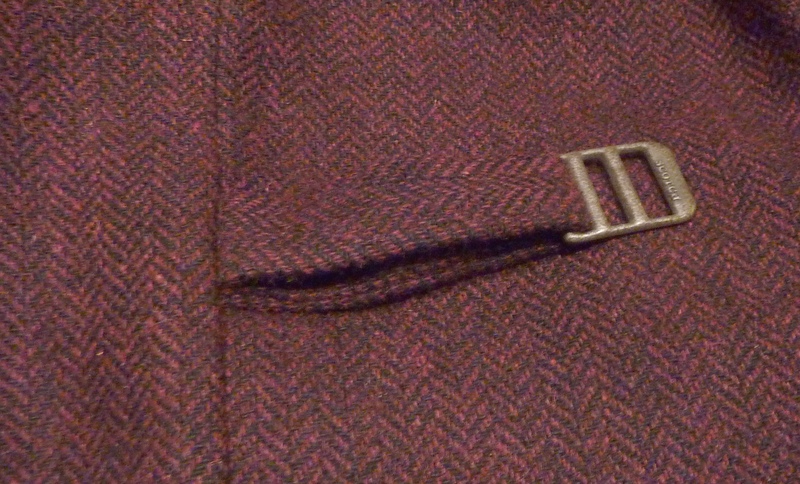 Most commonly there is a single cinch placed in the middle of the rear of the waistcoat. This is an acceptable variant, if designed properly so that it pulls equally on both sides. I have seen and used variants where this has been poorly executed resulting in a cinch that pulls mainly to one side. Did the designer even try to use it? The more advanced cinch is the double cinch. 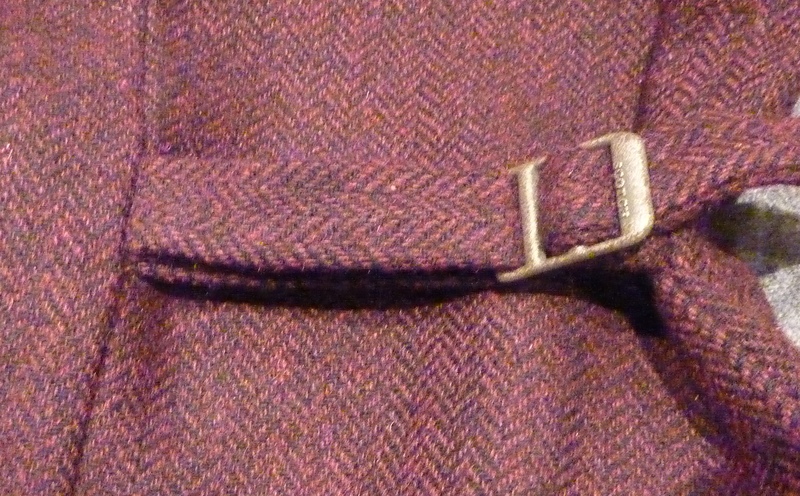 This consists of two shorter cinches, with one on either side of the rear of the waistcoat. Really an easier solution to get right, as it will tighten equally on both sides if the user adjusts it correctly. Less commonly used though, which is most likely due to the cost of buckles being double that of the single cinch. And of course, as mentioned before, the missing rear cinch. This is occasionally due to the style of the waistcoat being such that it would not benefit from adjustment, or it would appear that sometimes the designer just forgot about it. Innovative buttoned cinch by Arn Mercantile. So, we can have one or two cinches, how should a proper cinch be designed? Most commonly it is made of the same material as the waistcoat itself, either to blend with the back piece, or in a contrasting fabric. Both variants have their merits and it comes down to a matter of design intention. 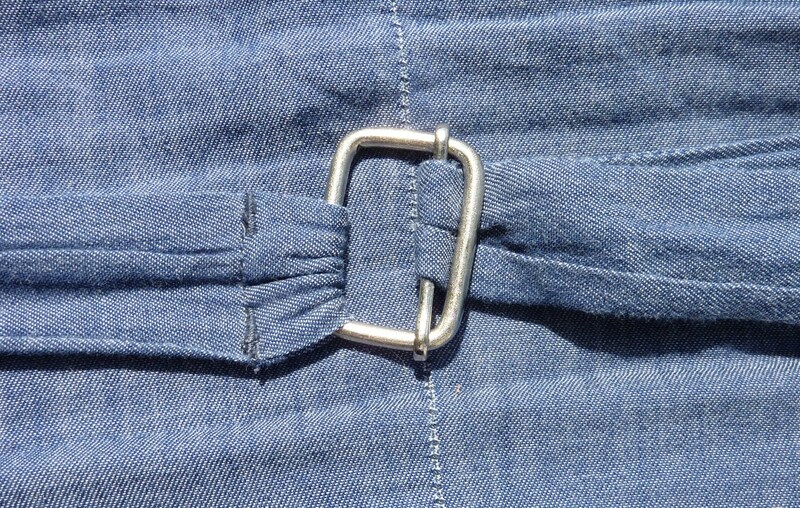 The two elements that go into making a cinch work properly are the buckle and the fabric used, and this is where the situation gets really bad. It shouldn’t take a civil engineer to point out the quite simple mechanics of buckle/fabric interaction, but clearly I have a mission to perform in this respect. Typically wonky hardware that will never really work all that well. 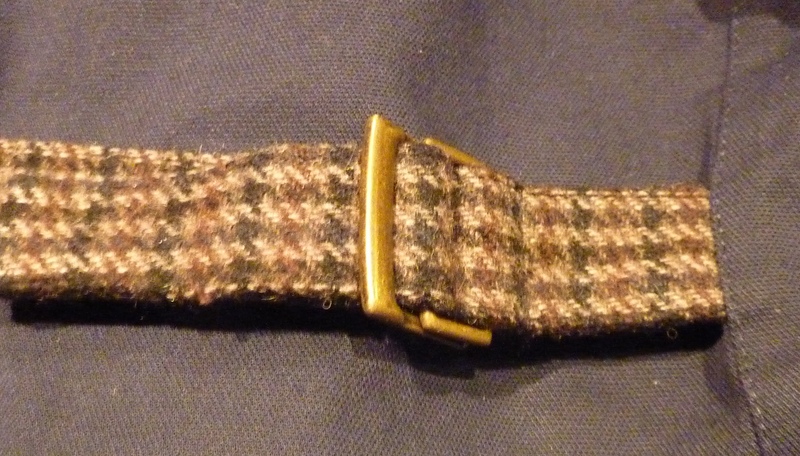 For a buckle to work there must be sufficient locking of the strap to the buckle. Sounds simple, right? I don’t even need to mention complicated stuff like frictional ratios between woven fabrics and forged metal surfaces. Yet I selected a number of waistcoats from my collection, studying the various solutions used, and found that a large number of them failed dismally. 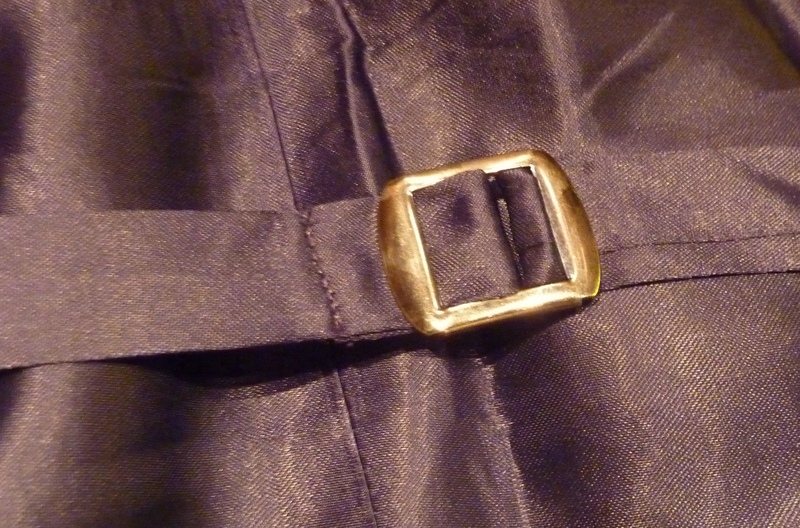 In some cases the fabric is just too smooth, usually when a silk-like material is used, but in most cases the buckles are just poorly made, poorly engineered, or just incorrect for the application. We’ll be looking at a number of exhibits to illustrate this. First out is this example from Universal Works. I like a lot of the clothes Universal Works make. Good designs, fair prices, ethically made. Yet the buckle on the two UW waistcoats I have is rubbish. Read two previous reviews here and here. Poorly executed cinch (same reason as stated above). 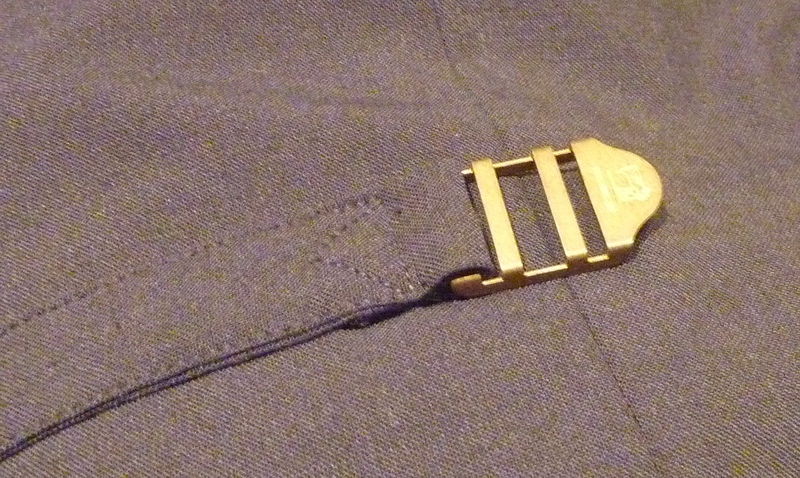 The problem here is that this buckle will only stay in place if the cinch is tightened really firmly. If there is any slack, it will come undone. The only way it will work is if you tie a knot. 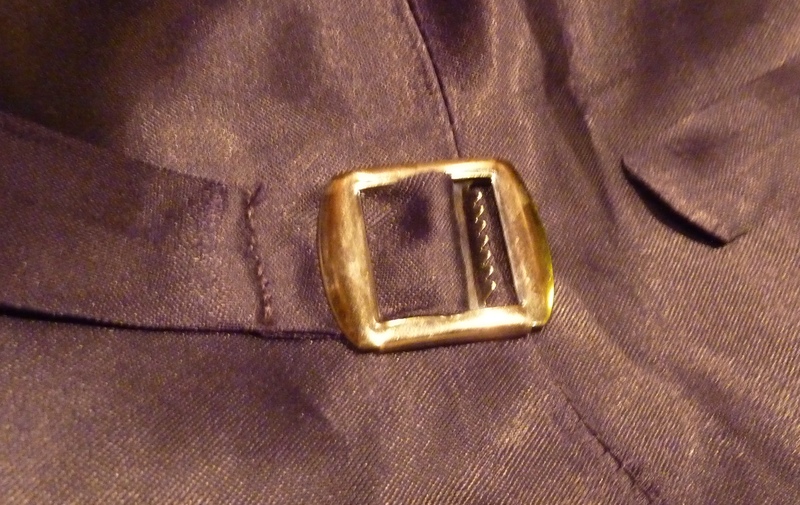 This is a really cheap and nasty buckle, and the otherwise fine waistcoats deserve better. Sorry, UW, you fail on this one! The next examples are from Scotch & Soda. Now, I quite like Scotch & Soda, they supported the waistcoat through tough times and helped bring it back to high street focus. They also put enough resources into their waistcoats to include such nice fripperies as custom made buttons and buckles. I’ve previous reviewed their efforts here and here. Custom brass buckle by Scotch & Soda, but does it work? So what could be the issue here? Well, the buckle is a custom brass piece, which is a really nice touch. The problem is, it just doesn’t work. At all. Any pressure at all and the cinch gives. So a little different from the UW example in that it only works under no pressure at all. Sorry, Scotch & Soda, you fail. And this isn’t the only time S&S make a mistake in cinching. Take this example, where the cinch is designed in a way that just won’t work at all. Notice how it is only tightened just a tiny little bit? And yet it has used up all the strap? Another fail by Scotch & Soda. Another by Scotch & Soda, possibly well engineered, but poorly executed. So, a few bad apples there, how about some that work? Yes, the international waistcoat buckle situation isn’t totally critical right yet, there are some makers that actually get it right. Take this example by Danish brand Sand. Previously reviewed here. The buckle isn’t very expensive or special, but it does actually work. 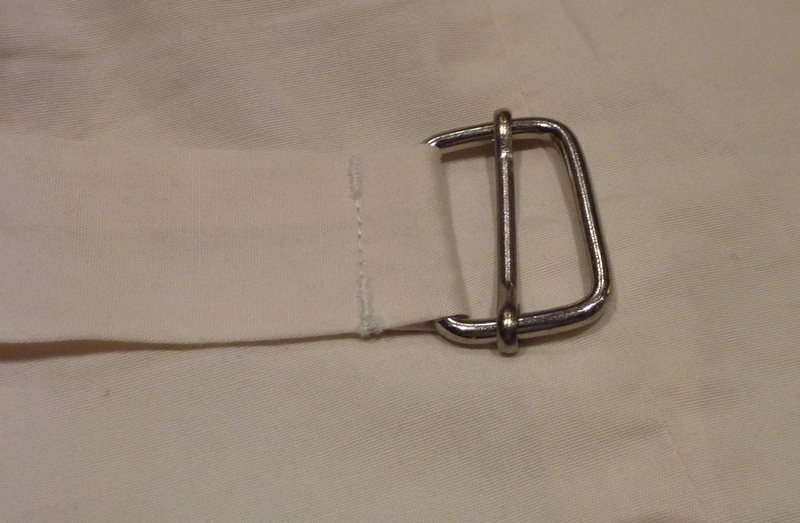 There is sufficient hold between metal and fabric for it to stay in place, aided by the serrated edge in the buckle. It doesn’t take space technology to do this. Well done, Sand! Another example by Scandinavian brand NN07 shows that when done with a little consideration, even a custom made brass buckle can work. This one has been reviewed here. Actually a surprisingly simple and efficient piece of engineering, and it holds really well. To me, the extra effort (and “we’re not pinching pennies”) is a nice statement of quality. Well done, NN07! 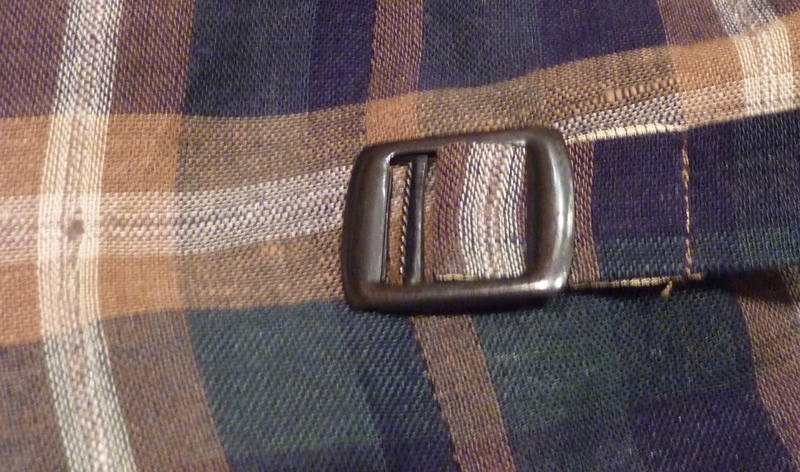 And just to show I’m not picking on Scotch & Soda, they can get it right as well, with another example of a custom buckle. This one is really simple though, and it works. Just a simple sheet metal buckle, but very well matched to the strap. Well done, Scotch & Soda! 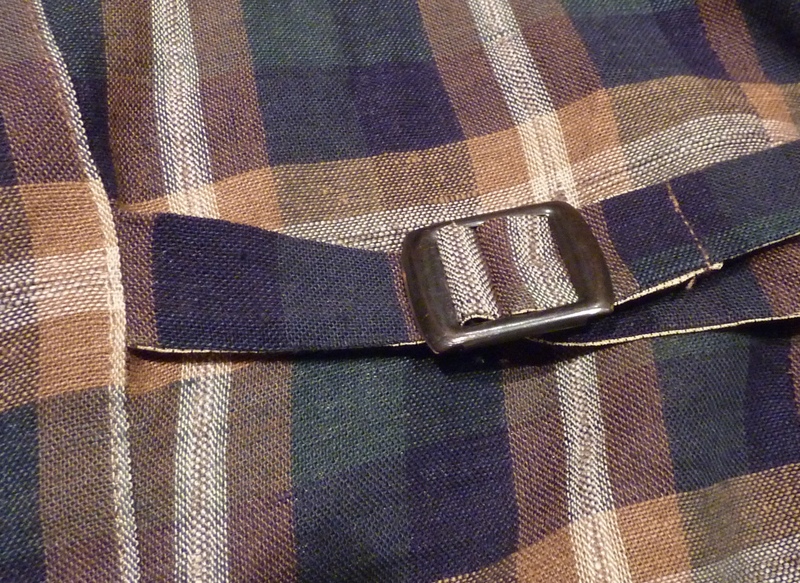 And to show that even with a silky fabric with almost no friction, and a buckle that is likely not among the really expensive ones, British upcycler Sir Plus does a decent job with their cinch. Reviewed here. As we can see, a little serration goes a long way to providing sufficient cinch security, and without making a huge engineering operation out of it. Well done, Sir Plus! 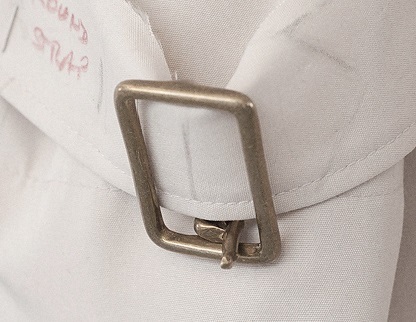 Finally, if a buckle is beyond budget, or the engineering of a working cinch is taxing the resources of the Department of Waistcoat Science and Engineering, perhaps a simpler solution might work better? 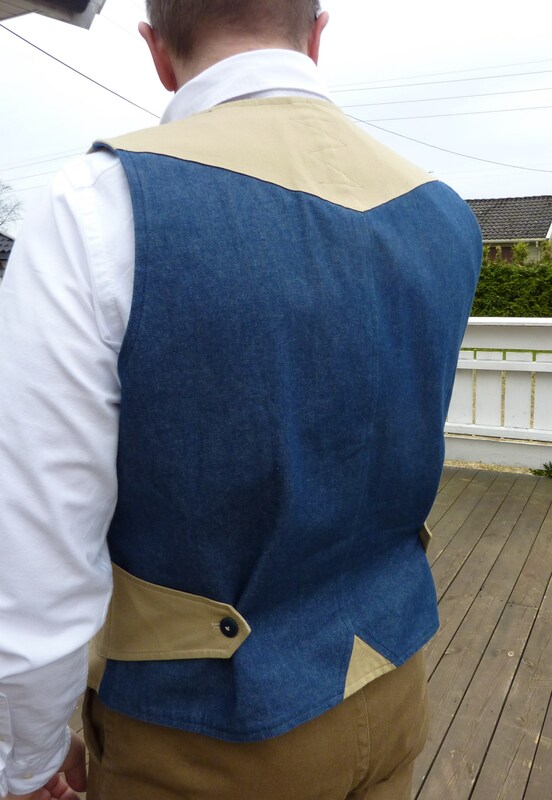 How about the solution favoured by a Levis waistcoat I recently added to the collection? Buttons. 2 positions. Almost no technology. It works. Well done, Levis. I’ll end my discourse with the solution used on one of my very favorite waistcoats. This one is by Whillas & Gunn (reviewed here) and is very much in the Australian outback style. Rugged, utilitarian, great pockets and just a great waistcoat. And the cinch solutuon? Even more basic than buttons. Waistcoat needs a little adjusting while you’re doing hazardous outback stuff, sun belting down from a cloudless sky, enduring ever present thirst? Just two straps, adjust them by untying and retying. Classic. Top marks, Whillas & Gunn. So there we are. Buckles and straps, it should be a cinch. Can we please see a little improvement from now on? I’ve just discovered your blog and love it. 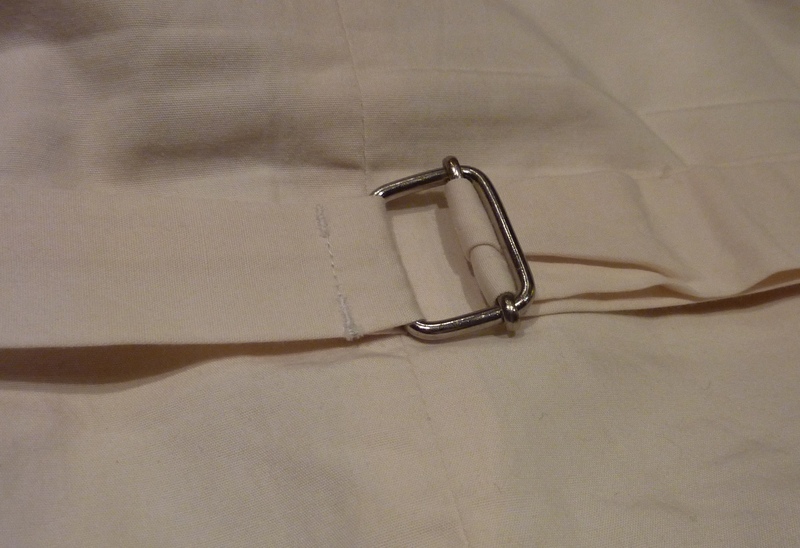 The problems with getting a decent cinch – ugh. I have the same difficulty. 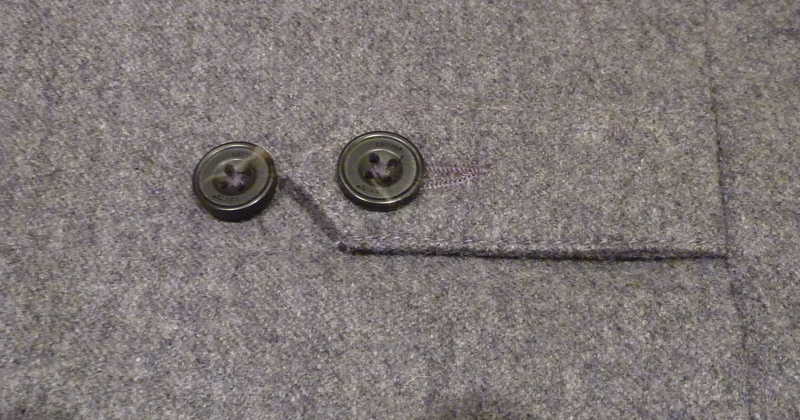 Also, getting a waistcoat that is provided with enough length and buttons at the front. My favourite is a soft woollen by Bugatti with a very good light blue interior. I envy your collection, though. You have a brilliant site here. Keep up the good work. 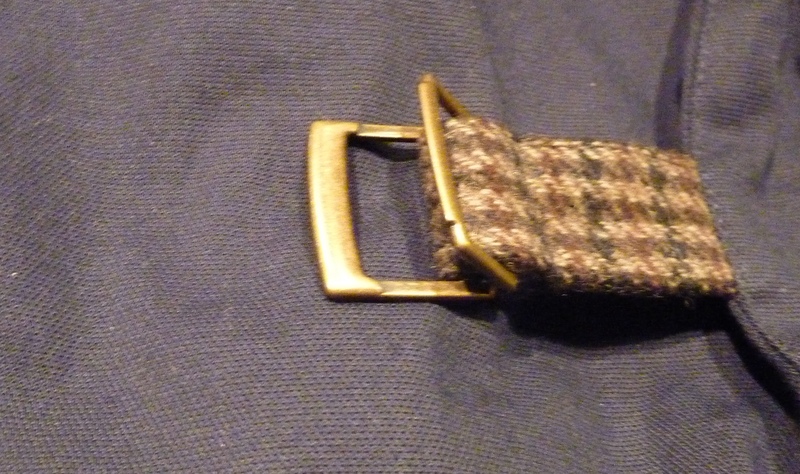 I’m pleased to have found your site too, now all I need is to find a supplier of a recommended buckle. If your local sewing shop doesn’t stock them, try eBay.